I’m not sure how many of you will have discovered the delights hidden in Chamber’s Book of Days. 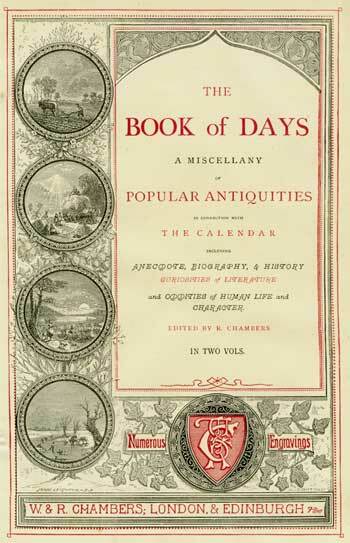 A Miscellany of Popular Antiquities in Connection with the Calendar, Including Anecdote, Biography, & History, Curiosities of Literature and Oddities of Human Life and Character. Unusually, (and luckily for those of us that are interested in such things) this is available for free on the internet in a hyper-linked and searchable format! I hesitate to give you the details here as you may get lost in it and forget to read the rest of this blog post but I’ll only forget if I leave it to the end so here it is. The Book of Days was part of the academic discipline of ‘folklore’ which was a sort of forerunner of anthropology. There were some folkorists operating in the eighteenth century, but it enjoyed an explosion of amateur interest in the nineteenth century when rapidly changing social and industrial circumstances gave many middle- and upper-class commentators cause for concern that the ‘old ways’ were dying out. I’m not going to go into detail about the trajectory of ‘Folklore’ as a subject of study, but it was ultimately unable to stand up to the more rigorous scientific approach of the anthropologists in the mid-twentieth century and therefore was abandoned. Chambers betrays his status here through his assumption that the newborn would share more than one room with the rest of his family, let alone possess a flight of stairs to another floor. Over 50 years later, Mabel Peacock’s unpublished account suggests a simplified version of the ritual. Other folklorists also mention this tradition, though I have yet to come across it in a midwifery textbook (as far as I can remember at any rate!). This makes it almost invisible in current histories of childbirth, yet it was an old custom when Chambers recorded it in 1869 and it was still being practiced in the 1920s when Mabel Peacock was collecting. The sheer tenacity of the custom tells us that it was important to the people that practiced it. I believe that its longevity is due to two key factors which can often be found in even modern birthing rituals. Firstly, it is simple and adaptable to just about every single birth situation. This means that it can be performed just as easily in a rural hovel as it can in a country house. It also means that it is easy to maintain ‘just in case’ and it can be practiced alongside the much newer discipline of obstetrics without entering into any conflict with the new procedures. Secondly, it appeals to maternal love – in fact to a general sentimentality when faced with a newborn infant – in wanting the best life for the new baby. This custom gives women a sense of control over their children’s futures, albeit fleeting and (in a world of high infant mortality) illusory. Like most personal rituals, it provided comfort and reassurance at a time of danger or difficulty and that made it almost impossible to shift until well into the twentieth century. As a social and cultural historian, it also makes me nervous. The only reference to this practice I have is in various folklore accounts – none of my ladies discuss it in their letters to each other. It was something that was done, not talked about, and it’s near invisibility to modern eyes despite its past importance really emphasises the difficulties that we face in trying to understand the past. Mabel Peacock, Folklore and Legends of Lincolnshire, 1927.